Punjab Chief Minister Captain Amarinder Singh on Tuesday visited the historic World War I Helles Memorial to pay his homage to the Commonwealth soldiers, including Indians, who laid down their lives in the Gallipoli campaign.On the 100th anniversary of the culmination of the 1st World War, the Chief Minister also visited the Turkish Memorial in memory of Seyit Ali Váabuk, usually called Corporal Seyit - a First World War gunner in the Ottoman Army. He is known for having carried three shells to an artillery piece during the Allied attempt to force its way through the Dardanelles on 18 March 1915.Captain Amarinder Singh spent several minutes at the Helles Memorial, or the Commonwealth War Graves Commission memorial, near Sedd el Bahr in Turkey. He placed a wreath on behalf of the ‘People of Punjab’ at the memorial and then placed flowers at the graves of some of the soldiers. Besides the soldiers who laid their lives in the Gallipoli Campaign of 1915-16, the memorial is a tribute to the 20,956 Commonwealth servicemen with no known grave who died in the campaign that took place during the 1st World War. The British and Indian forces named on the memorial were those who had died in operations throughout the peninsula. The Chief Minister saluted the brave soldiers who paid with their lives to make the ultimate sacrifice during the war. He lauded the contribution of the Indian soldiers, who were killed and buried in distant land, far from their home and families. The Helles Memorial has the names of the Indian soldiers, including the large number of Sikhs killed in the battle. The 29th Indian Infantry Brigade, which comprised 14th Ferozepur Sikhs and was part of the 10th division on the Suez. The brigade was detached and sent to reinforce 29 British Infantry Division that had suffered heavy casualty. The 29th Indian Infantry brigade comprised 14 Ferozepur Sikhs (later 1st Sikhs and current 4 Mechanized); 1/6th Gurkha Rifle (currently part of UK Gurkha Brigade); 69 Punjabi (currently 1st Guard) and 89 Punjabi (currently 1s Baluch Pak). By the time their detachment was over, a total of 1530 were killed and 3413 wounded. The 1st Patiala (now 15 Punjab, India) took part in the third battle of Krithia, where they lost the entire force - 280 dead and 800 plus wounded.At the Turkish Memorial earlier, the Chief Minister was received by Chairman of Gallipoli Historic Sites and former Parliamentarian Ismail Kasdemir at the Turkish Memorial, who showed him around the site. 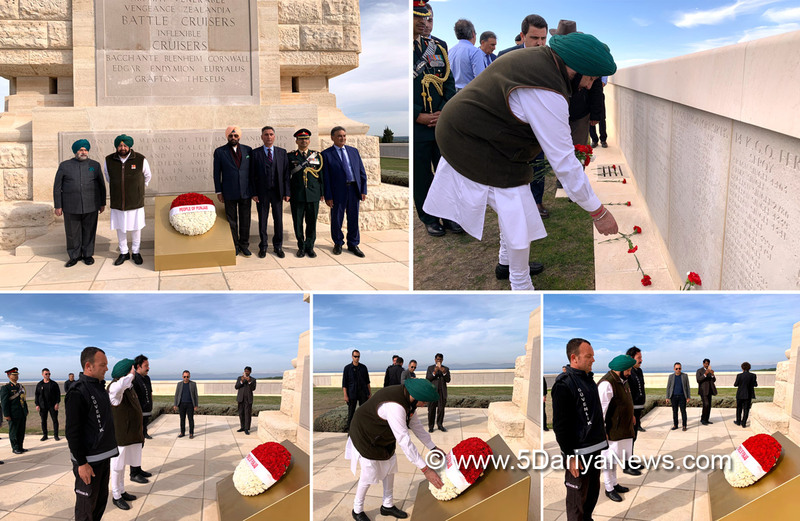 Captain Amarinder Singh also visited and paid floral tributes at the graves of 60,000 Turkish soldiers buried there.As many as half a million people died in 250 days of the war, with an equal number of Turkish and Allied casualties, even though the Allied forces succeeded in advancing only 4 kms during this period.While Kasdemir presented to the Chief Minister a memento, the latter gifted him a set of his books, including one on the contribution of Indian Soldiers to World War, Honour and Fidelity.The Chief Minister was accompanied by Sports Minister, Rana Gurmeet Singh Sodhi, Advocate General, Atul Nanda, his Media Advisor, Raveen Thukral and Advisor, BIS Chahal.